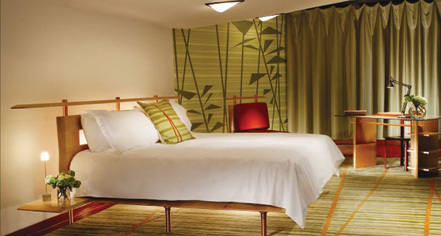 Inn at Price Tower, an intimate hotel with 19 guestrooms, opened in 2003 and occupies seven of the upper floors of famed mid-century architect Frank Lloyd Wright’s only skyscraper, Price Tower, built in 1956. Like Edgar Allan Poe’s “dream within a dream,” the Price Tower experience is “art within art” – a tapestry of remarkable architecture, art, and design set within the masterpiece. An architectural beacon standing 19 stories above the American prairie, this National Historical Landmark and World Heritage Nominee draws audiences from around the world to explore its rich history, dynamic exhibitions and collections of art, and elegant hospitality. Inside its cantilevered and copper-patina stories, guests will interact with Wright in concert with nature’s influences. Acclaimed modern architect of New York, Wendy Evans Joseph, updated the meticulously detailed and graciously appointed Inn guestrooms. At the Inn, guests can enjoy the complimentary historic tower tour and access to the Arts Center exhibition spaces. 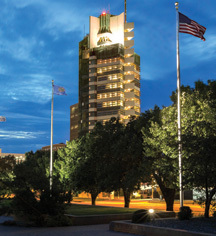 Inn at Price Tower, a member of Historic Hotels of America since 2014, dates back to 1956. Originally , Frank Lloyd Wright wanted the building’s copper to age naturally; however, since he was age 89 when the project was completed, he had an acid-wash developed to speed up the patina process. Pet Policy: Service animals allowed: Yes. Pets allowed: Yes. Learn more about the History of Inn at Price Tower .